A photographics exhibition from the Tread of Pioneers Museum collection of significant buildings lost over the years. River rock, logs and quarry stone: the practical builders and architects of Routt County used locally available material to build Steamboat Springs� early stores, schools and churches. As a result, those buildings reflected history, geology, talent and Northwest Colorado style. Today many of those historic buildings have been preserved, but many have literally gone up in flames. Still others have given way to time and growth. Although the buildings themselves may have been lost, they remain in stories passed down through generations, and in the photographic archives of the Tread of Pioneers Museum. When members of the local chapter of the American Institute of Architects were looking for a way to celebrate Architecture Month in April 2014, they began talking about those lost, but not forgotten, structures. The result is �Lost Steamboat,� a collection of 12 images of now-gone historic buildings. The Tread of Pioneers, Historic Routt County and the city�s preservation committee teamed up with Colorado West AIA to present the exhibit. Photographicsart printed and mounted the images, and KSA helped to sponsor the collection. �It was a great, almost spontaneous collaboration,� recalls AIA member Adam Wright of KSA. From the wealth of material at the museum, the group narrowed the list down to a dozen buildings. Location, recognizable artifacts and compelling images were criteria. 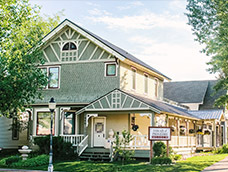 Arianth� Stettner of Historic Routt County wrote short, defining paragraphs for each of the buildings. The group hoped the exhibit would travel after its time at the museum in 2014-15. 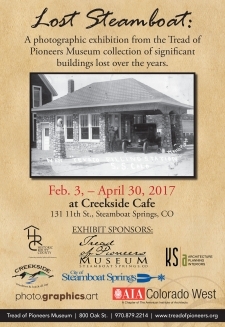 �Lost Steamboat� will open at the Creekside Caf� (131 11th St, Steamboat Springs, CO 80487) on Feb. 3, 2017.